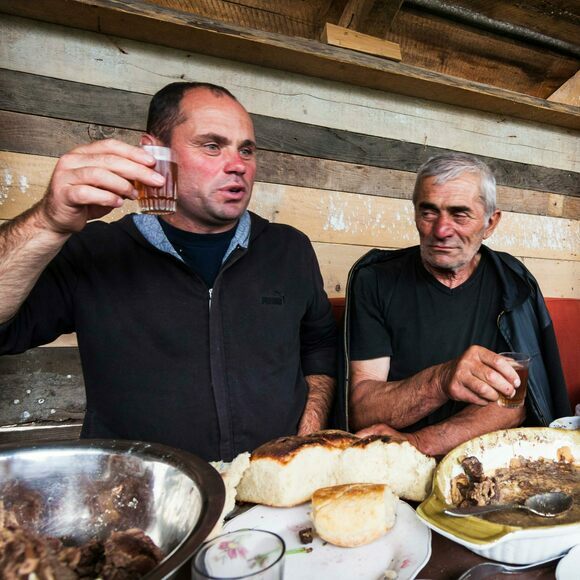 A supra, which translates to “tablecloth,” is a centuries-old Georgian feast. This lavish meal can be held for weddings, birthdays, baptisms, or funerals, to reconnect with friends or welcome a guest. Hospitality is central to Georgian culture, and supras are a treasured national ritual characterized by lots of food, lots of wine, and lots of rules. A supra is directed by the tamada, or toastmaster, and marked by frequent toasts, each of which may go on for several minutes. Toasting is an art form in the Eastern European country, and the tamada will pepper his speech with references to history, literature, and philosophy. He—and it’s almost always a he, though that’s starting to change—will lead the party in raising a glass to various entities ranging from God to the host to the dearly departed. Guests are then invited to add their own toasts, which are governed by a specific order. If you’re lucky enough to be invited to a supra, come ready to eat a lot—slowly. The table will be laden with Georgian favorites such as the cheesy bread known as khachapuri and grilled meat with sour plum sauce. Supras can run well into the night, so veterans say it’s crucial to pace yourself. You’ll want to save some room for khinkali, large, savory dumplings that are often served later in the meal. The tamada may call on you to say a few words, so have something in mind. You can’t go wrong by toasting your hosts and the beautiful country of Georgia. Practice defensive drinking: Guzzle water or Georgian tarragon soda between speeches. You may be urged to drain your glass with each toast, or to chug from the khantsi, a ram, goat, or bull's horn filled with wine. It's bad form to toast with beer, talk during the toasts, or sip alcohol outside of them. The traditional way to send a stream of wine straight to your mouth.